A city builder i made. Press escape at any time to access the menu. 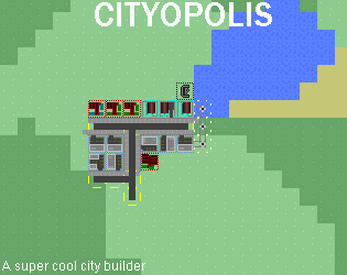 Left click places buildings. Mouse-wheel changes what building is selected. Currently to make money Housing sectors must be connected to commercial sectors. This will generate money based of the distance to the commercial sector. Housing sectors will only spend money they have earned by working at Industrial sectors these three sectors must be connected by roads. Housing and Industrial must be provided power to function. Power is generated by Coal and Nuclear. These must be connected via power lines. All the sectors also count as power-lines. Power generators cost upkeep per cycle. We have a discord where you can come and talk about the game and its development. Download the application and run it. Windows might not trust it running should be fine.